Chicken Cordon Bleu baked in the oven and topped with a delicious sauce. No need to pound chicken breasts with this easy method! I’m so excited to share this chicken cordon bleu recipe with you all! The main reason I LOVE this recipe is purely because of the method. 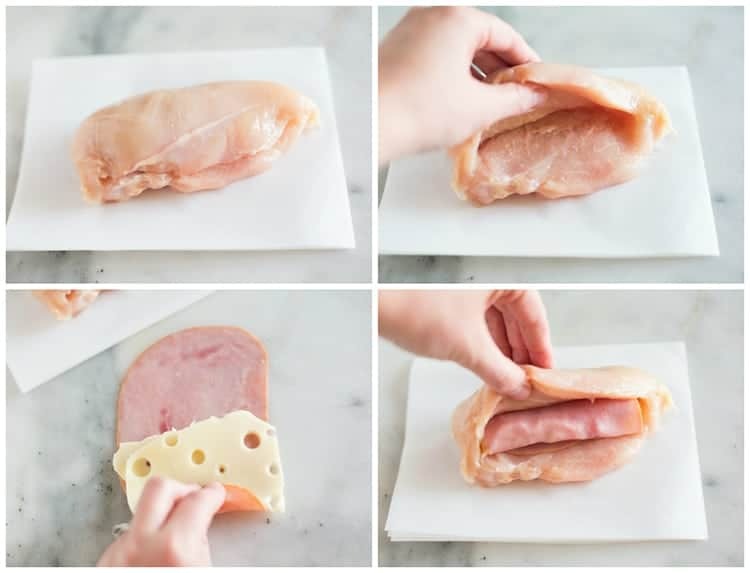 If you’ve ever made traditional chicken cordon bleu before you may have been like me–pulling your hair out trying to “pound” chicken breasts into even, thin pieces, to then “neatly” roll up with ham and cheese. Ya, that “neat” part, never happened. It’s so much easier said then done and I never found it worth the effort. 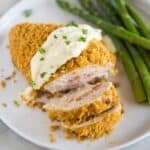 So if you’re like me and ever felt frustrated making chicken cordon bleu in the past (or just felt like it was too messy and time consuming) then THIS recipe is for you! Instead of pounding the chicken breasts, I choose thick chicken breasts and I use a knife to slice a deep pocket in each. Then I just stuff the ham and cheese inside the pocket in the chicken. It’s so much easier and less messy! Start by cutting a deep pocket into the thickest part of your chicken breast. Be careful not to cut the breast completely in half, we just want a deep enough pocket to stuff a roll-up of ham and cheese. Next, lay two thin slices of ham on top of each other on a flat surface. Place slices (or shredded) Swiss cheese on top and roll it up. Place the ham and cheese roll up inside the pocket of the chicken breast. Close the pocket by pulling the top flap of the chicken breast and securing the edges closed with toothpicks. (I usually cut my toothpicks in half). Dip the chicken breast in melted butter and then coat both sides in corn flake crumbs. Bake the chicken on a greased baking sheet until cooked through, about 25-30 minutes. What kind of cheese do you use in chicken cordon bleu? The most popular type of cheese to use when making chicken cordon bleu is Swiss cheese. The flavors of Swiss cheese pair well with ham and chicken, though you could substitute other meats or cheeses for this recipe and I have no doubt the results would be equally as delicious! 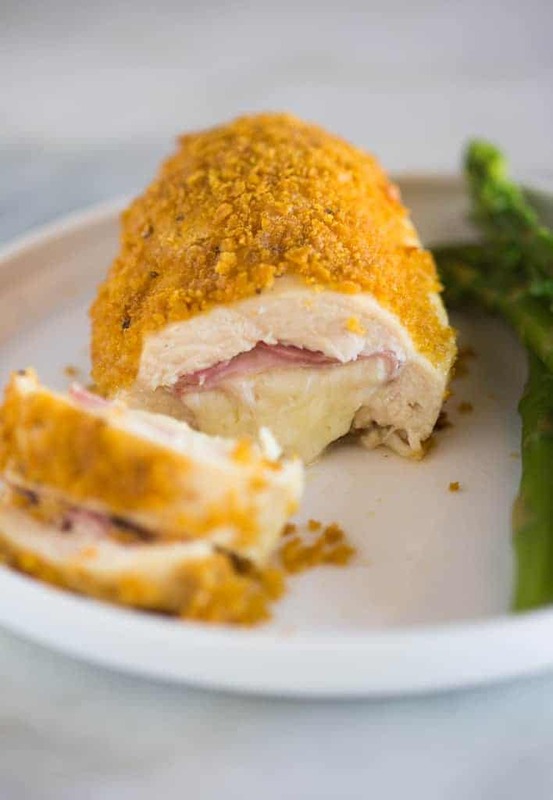 Chicken cordon bleu is usually pan fried or baked in the oven. For this recipe, bake your chicken cordon bleu at 400 degrees F for 25-30 minutes. The sauce I use for my chicken cordon bleu is simply mayonnaise and mustard mixed together. It’s how I had it growing up and as simple as it sounds, it’s delicious! You could also try this parmesan cream sauce or this dijon cream sauce. 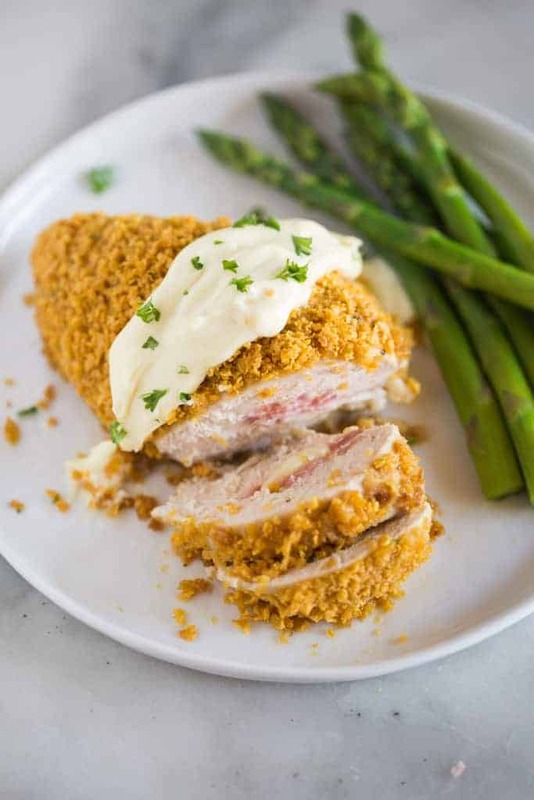 Chicken Cordon Bleu baked in the oven and topped with a simple cream sauce. This easy recipe uses a stuffing method instead of the hassle of pounding out chicken breasts. Add cornflakes to a food processor and pulse into fine crumbs. Add crumbs to a shallow dish or pie plate. Set aside. Melt butter in a separate shallow dish. Set aside. Preheat oven to 400 degrees F.
Top each ham slice with 2 thin slices of Swiss cheese or a handful of shredded cheese and roll tightly together. Set aside. Pat the chicken dry with paper towels. Use a sharp knife to cut a pocket in the thickest part of the chicken breast, following the photos above. Season both sides of the chicken with salt and pepper. Place the ham and cheese rolls inside the pocket in the chicken breasts. Secure the edges of the chicken shut with toothpicks. 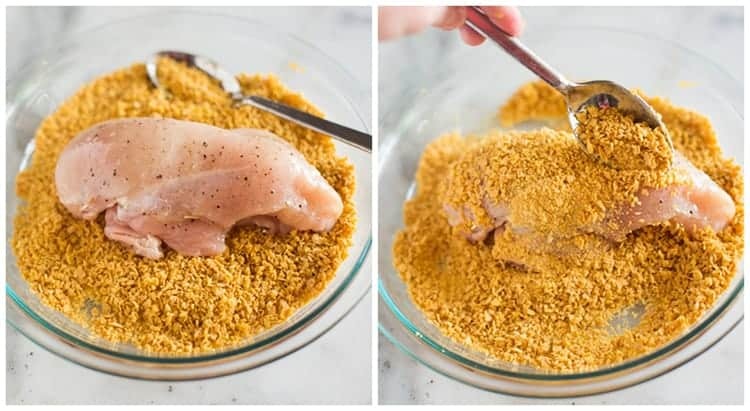 Use tongs to gently dip the chicken in melted butter on both sides, and then into the cornflake crumbs, pressing lightly to help the crumbs stick to the chicken. Transfer the chicken to a lightly greased baking sheet. Make the sauce by stirring the mayo and mustard together. Taste and add more mustard, as needed, to taste. The breaded and stuffed (uncooked chicken) can be refrigerated up to 1 day in advance. Bake as directed, but you may need to add a few more minutes to the cook time. Linda & I were alone for Thanksgiving dinner this year so I decided that, instead of dealing with all the left-over turkey, I would anchor the meal with this recipe. We are both glad I did. Stuffing the breast was a great idea and so simple relative to the paillard method. It was delicious, presented well and was easy. Thank you for an all around great recipe. Thanks Wally–what a great idea for Thanksgiving for two. I’m happy you enjoyed it! I have never been into the whole pounding chicken thing so thought I would give this method a try. So yummy. I cut my ham/cheese rolls in half and double stuffed each breast. They turned out perfect! My husband raved! When you use the corn flakes cereal, the skin turned out amazing! ??? How on earth have I never tried this before!! This looks amazing! Can’t wait to try this!